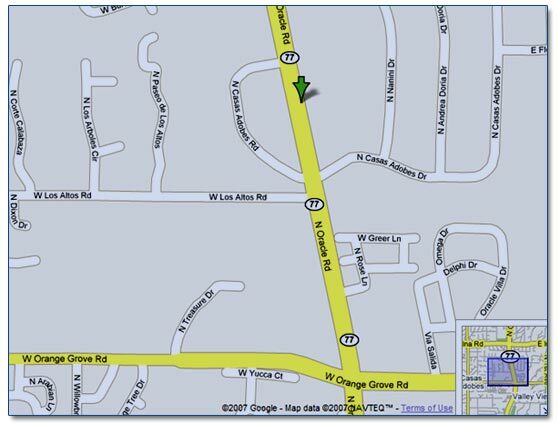 Our office is approximately .5 mile north of Orange Grove and .5 mile south of Ina Road on the east side of Oracle Road. The information provided in our firm's web site is offered purely for informational purposes. It is not intended to create or promote an attorney-client relationship, and does not constitute and should not be relied upon as legal advice. It is not intended to seek professional employment in any state where lawyers in the firm are not admitted to practice, or in any state where this web site would not comply with applicable requirements concerning advertisements and solicitations. We intend to make every attempt to keep this information current. We do not promise or guarantee, however, that the information is correct, complete or up-to-date, and online readers should not act based upon this information without seeking professional counsel from an attorney admitted to practice in your location. Transmission of information from this web site is not intended to create, and its receipt does not constitute, an attorney-client relationship with our law firm or any of its individual attorneys or personnel. If you elect to communicate with the firm, or any of its attorneys, through this web site, do not transmit any information about any matter (and particularly not any confidential information) that may involve you until the firm has agreed to represent you, and you have received confirmation of that fact in the form of a written engagement letter.